AAP’s Delhi Power Policy: who benefits? AAP’s Delhi Power Policy: Higher benefits for the better-off? Aam Aadmi Party (AAP) has delivered on its promise of reducing electricity rates by 50% within three days of assuming power in Delhi and made its implementation effective from 1 January 2014 for three months. Whereas in case of water, the route adopted by AAP was to cross-subsidize part of the population (read detailed analysis of impact of AAP’s water policy on different consumer classes here), in case of electricity, Delhi government has announced a budgetary subsidy to be paid to distribution companies (discoms) from Delhi exchequer as fixing power tariff comes under the purview of Delhi Electricity Regulatory Commission (DERC) and not the Delhi government. 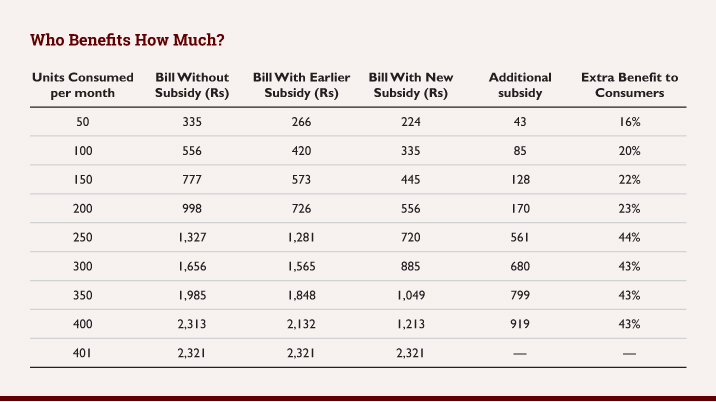 How does the subsidy affect the Aam Aadmi? It may surprise your to know that middle-class is a far bigger beneficiary of the power rate cut than the poorer sections. Firstly, it has disappointed those who believed that reduction in electricity rates would be across-the-board and that it would be come from the discoms that are suspected to be fudging their accounts, even though AAP has also announced a move to begin audit of discom’s account books. But the bigger question is as to how does this budgetary subsidy impact different consumer classes in Delhi? Is it a subsidy for the really poor or the middle class? Also, what impact it may have on discom’s finances and government exchequer? Is it a prudent decision or it adds more fire to a ticking time-bomb? The metered slab-wise energy charge for domestic consumers without subsidy, with subsidy applicable before the new order and current subsidy after the new order is given below. We have not considered consumers in other categories as present subsidy is not applicable to them. Additionally, there is an 8% surcharge (levied on metered slab-wise energy charge and fixed charge net of subsidy) and 5% Electricity Tax (levied on final amount). There is one more charge -- Power Purchase Adjustment Charge (PPAC) -- which has been discontinued from 31st July 2013. So, how does it change the billing for consumers at different consumption points? Below is the table (Table 1.3) and graph (Graph 1.1) for comparison. Also, BSES companies claim a cost of Rs7.40 per unit for supplying power in Delhi, but more on this later. What are the conclusions from these tables and graph? The question is: what kind of consumers consume up to 400 units of power in a month? Are they poor households or middle-class households, even assuming they are all Aam Admi? 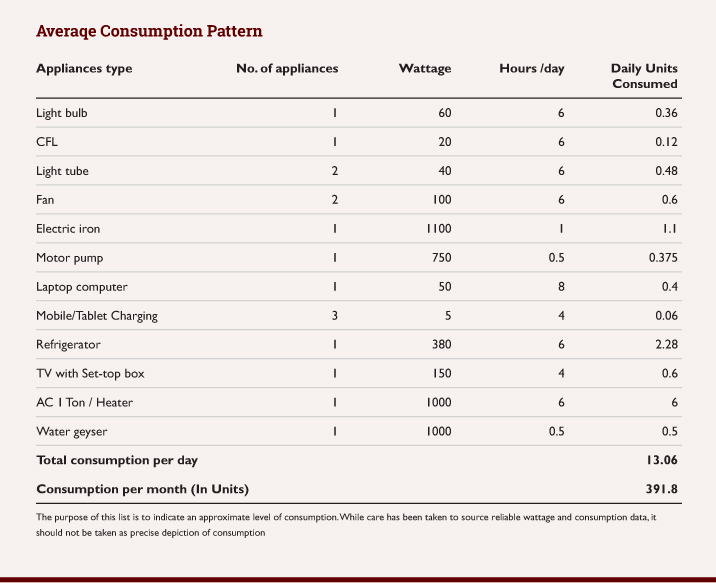 For an answer consider the table below (Table 1.4) of power consumption of different household appliances for a broadly representative household that may limit their consumption up to 400 units. Note that the list indicates that a household would be able to afford 1 AC of 1 Ton for cooling, geyser for heating water and yet limit their consumption within the 400-unit limit to gain from new subsidy regime. In our view, such consumption is possible for a middle-class household and is definitely not indicative of a poor household. Our experience is that for four winter months in a year when air-conditioning is not required, middle-class households (who use more appliances like microwave oven, food processor, lot more lighting, washing machine, vacuum cleaners etc.) generally do not cross the 400-unit consumption threshold. It is a moot point whether such consumption pattern should be eligible for subsidy. Also, as per the ET report, this move is going to benefit ~80% of household with electricity connection. Again, it’s difficult to understand why the capital of India needs power subsidy for 80% of its population. Due to middle-class activism, Delhi government had started providing subsidy from around April 2012 for 0-200 units slab and later announced it for 200-400 units slab as well. 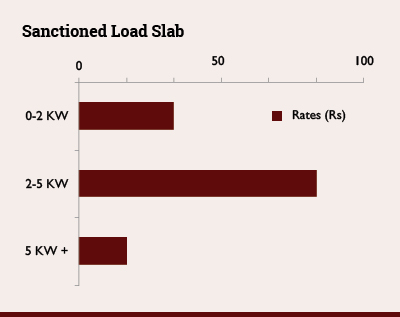 After the announcement of new tariff order by DERC for FY14, whereby rates were increased by 5%, such increase was made good to discoms by Delhi government by increasing quantum of subsidy (from Rs1 to Rs1.20 in Aug 2013) and therefore there was no impact in billed rates to consumers for consumption up to 400 units. Given this background and widespread support to AAP by middle-class, it is not surprising that Kejriwal has taken care of this constituency by bringing in new subsidy regime. Reduction in tariff is because of subsidy not because of the Hera feri in account as claimed by Kejriwal.It is to be seen how AAP would arrange subsidy . Either they have to raise taxes or borrow from central govt. What AAP claimed in their manifesto that they would catch the corruption of discoms & bring down the rates. AAP is inhurry to reduce rate as populist measure through which many parties like cong,bjp have been doing.He should have given almost free power to poors who live in one room & use only one bulb & one fan i.e. up to 50 units per month. it is biggest curruption by a party which took birth from india against curruption. it is bribe given to voters if congress were not to support confidence motion. so there is nothing different in aap it is on among the aam parties. A A P has only one Policy - "Power". you have ignored one more aspect many a times there wil be submeters 2 to 3 in each metre becasue of renting out. and actually many who are tenents who deserve but will not get it as combined bill will show more than 400 units. further earlier his argument was that due to curuption and connivance of congress govt electricity charge are high. but now by giving subsidy he has justified the higher rate. he is more dangerous politician than all prevailing now. Another excellent article. Look forward to the sequel. When electricity bills in Delhi are higher than they are in Zurich (my source is a friend in New Rajinder Nagar, but fact could easily be verified), then it does seem that the entirety of the middle class SHOULD benefit. This and the water article have illumined the complexity that exemplifies day to day Delhi life. As a principle, would you not agree that any tariff system should be simple, both to understand and to administer? Otherwise in the name of meeting the needs of ever more artificially created segments of population you set up bureaucratic edifices to check bills while having no-one, apparently (from water article), to either repair or check meters. I completely agree with the principle that unwarranted complexity in the system increases inspector raj. The reason I think they are right is that it appears that, setting the question of who is being subsidised aside, this step does actually reducie the numbers of separate possible categories of bill - it creates a larger middle category, does it not? This is then leading to interesting questions in the private rented sector about the behaviour of private landlords to their tenants. It is like the layers of an onion! Is it the responsibility of government to make private landlords behave responsibly towards their tenants? Or should the landlord pass on the benefits anyway? Look forward to your next piece. In my opinion large scale governance reforms could very well have less impact than this incremental approach. Large-scale governance reforms could have less impact than this incremental approach? I think there is no evidence in economics (anywhere in the world) to support that argument. Reminds me of V.P. Singh who had inspired us as teenagers, only to disappoint very badly later. Look at all those folks entering AAP today. A danseuse who considers GDP to be of little significance for a nation's future; a failed businessperson who bankrupted airline firms; an opportunist who was an "independent" politician for so long; an academic with almost no background in economics but claiming to be an adviser on everything under the sun. I was expressing an opinion, rather than asserting a fact. Also VP Singh attempted large scale rather than incremental. Based on the analyses in Mr Khaitans articles, it does appear that these steps will make a difference to consumers. How can it be represented as a bad thing that dancers and others of whatever professional background want to get involved in politics and the good governance of the country? Is it not right that parliament should be made up of people who have had a range of different life experiences? I think the incremental change is what you referred to w.r.t this electricity policy. And I doubt if Vivek is praising the new policy. So not sure what you mean by saying that his analysis shows this will make a difference to consumers (unless you mean a negative difference). Such pricing policies are known to encourage wastage and to eventually burden taxpayers (the very same people who are seeing the benefits now). VP Singh carried out a LARGE-SCALE (agree!) social experiment that left the country maimed for decades. Mr. YY is suggesting something similar. That's why AAP reminds me of VP. I have no problems with a diverse set of ppl (from any party for that matter) in politics. In fact, I am all for it, but not if they think GDP, or other economic indices, are of no significance in decision-making. Developing nations need infrastructure, reduced red tape, a well-regulated stock market, and an environment conducive to business. These opportunists in AAP don't care for any of this. They are there for an LS ticket, my friend! I am too old to be fooled! The wonderful Kiran Bedi (one generation older than me) knew better and stayed away from AAP. This has been a rapidly implemented policy, as was the water one. Vivek clearly was not praising either policy, however both his analyses were enlightening. There is a further analysis to come I believe, but my question was, is it not the case that the policy has in effect simplified the 'system' by reducing the number of subcategories of bill and creating a larger 'middle' category of consumer, many of whom may see some immediate relief in their cost of living. Has it been suggested that subsidy is the mid to long term strategy of the Delhi Govt? I don't see that there is anything intrinsically socialistic in this current subsidy, given that there are many non-functioning parts of the 'system' (water meters being one example), which need to be attended to properly, and which can't be fixed by waving a magic wand. As to Kiran Bedi, there is nothing surprising about her decision. With a background in the police her choices are likely - this is an opinion - to err on the side of the conservative and known, rather than the radical and untested. As long as there are people, senior people in a political party who do understand GDP and growth - pretty fundamental for governing after all - there should surely also be room for others, and for other priorities. When you say infrastructure, do you include in that the infrastructure of governance? aap is being mobbed by people who are conscious of their right than conscious of their duty. then it will lead to caos because every one is fighting for his right than performing his duty. Agree! It's a lot like VP Singh's Janata Dal (or whatever it was called). Full of opportunists wanting to be MPs. There were some honest ppl there just there are in AAP. Reduction of any charge through subsidy is nothing but juggling of accounts and will not provide any solution in the long term. I would have admired AAP had they promissed to enforce discipline, transperancy and improve efficiency in the EB to provide power at cost+ x% ( to cover the future capital expenses,besides fixed costs and oil prices) instead of blind offer of 50% ( which also comes through subsidy ) This is nothing but tempting the public with some sort of of bribe. It is an irony that the party wanting to eradicate bribe has come to power through bribing people. Thye are enalrging the options with new reservations, and others. This indicates that AAP has arrived in the Political arena and are not much different from others. I fail to see how it is a bribe, to offer hard-pressed consumers some immediate relief, while in parallel working out the best means of 'enforcing discipline, transparency etc.' Those are words which are easy to say, and moreover to appear to be doing something. What they have done is very concrete. it is just like colour tv, laptop, cooker etc announcing these things in election is bribing the voters only and today we are seing the result of these feebees. we elect people to mainain law and order and not to indulge in such gimmicks. They are in government and have implemented a policy which i believe is offering relief to hard pressed consumers - month on month, not a one-off TV or something like that. Cost of living is an economic concern - or not? govt giving subsidy is nothing but moving cash from one pocket to other pocket. it will be recovered from you through other taxes and inflation. so wrong policies of robing john to provide for robert will not serve any pupose. and this is being used to the hilt now a days and people have started believing these tactics are part of governance and fooling themselves. Actually, it is difficult to make any sense of what Mr. AK is doing --- subsidy or no subsidy. He's the same age as me, but he thinks people have forgotten VP Singh and his double talk. After all the claims made during the campaign about Sheila D's corruption, he now says he knows nothing about it (exactly what VP did after becoming PM!). One day his closest associate asks for a referendum in JK (have they ever talked to any JK Pandits? ), and the next day, he dissociates himself from those comments. Then, he goes to hug Sibal (poor Anna doesn't need to see that photo! ), and today his "law" minister is in legal trouble from the courts, but he is defending him --- saying the court is wrong! Boy, have you ever seen a more rocky start to a CM's tenure? Of course law and order is a matter for government but so is cost of living and hundreds of other things. all these half hearted moves are taken in a hurry to ensure themselves reelection if congress do not support their confidence motion and reelection were to be held. this is biggest curruption by a party which came to politics with lokpal. I fully agree Mr Varadarajan. By agreeing to provide subsidy the AAP conceded to the pricing of the previous government that carried with it all the leakages and outages. It is necessary to reduce the costs of delivery and reduce the price per se as a reform measure. Does not matter if AAP govt takes a little more time to do such exercise. It is worthwhile examining whether every dwelling unit should have independent meters instead of sub-meters when it would be possible for any concessionary or regulatory measure can easily be taken care of better. Further, most houses use non-standard electrical wires and switches and switch boards as also main switches. By adopting standard electric ware and having a plan for modification, transmission leakages can be arrested. The costs incurred for this purpose can be subsidized by the Government to the extent feasible. 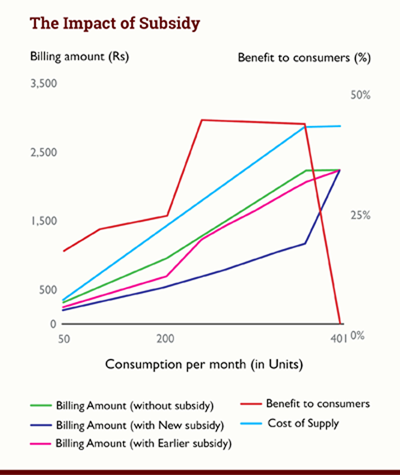 This subsidy would add efficiency to the system on a permanent basis. Sale of non-standard items should be banned legally by amending the State Acts. One of the reasons that politicians encourage this subsidy culture is the rewards they reap due to immense attraction of freebies in our society. Like any other human being, politicians respond to the way their incentives are structured. AAM ADMI PARTY or AMIR ADMI PARTY? Are Mr. Balakrishnan (INFOSYS) and Captain Gopinath AAM ADMI? Well at least some people are not swayed by the half baked, ill thought out populist promises of this new kid in town. I hope the scales fall off the eyes of rest of the intelligentsia and media soon or we might see instability or worse communists as our rulers. The source of anomaly such that the upper middle class and rich benefits more from AAP's new tariff stems from the fact that they have broadened the concessions upto 400 Units. Poor man uses less than 100 units and middle class should be upto 180 units. Anyone using more electricity than this is using sophisticated gadgets beyond the reach of 'common man'. As a wise energy policy concession should not be extended to those who consume large amount. AAP's "power" policy itself is defective in a democratic country as its leadership is a secret society. Now they are panning to contest Lok Sabha elections. Only God knows whether AAP supports Congress or not after the Lok Sabha elections. Are Kejriwal & Co., Congress 'B' team? Leave off the party leanings. How do these measures measure up to the electoral promises? AAP delivered its promise. The implications will come to a cross during the course of implementation. When the State Budget goes for a toss, the real economics will come to play. You have to rob the Paul to pay the Peter if distributive justice has to play its part sooner than later. The rich would have to pay - the middle class of which so much noise is made have always been at the worst paying end. The rich get away with their ability to bear the burden; the poor have the subsidies with no income tax to pay as they are within the threshold level; it is the middle class who pay all taxes and cess. I do not see any reason for the growl when they get a cake of what they pay through their other valet. Whatever given in the Article is Fact, But this may not be intentional. Arvind Kejriwal is really a person with High integrity. Give him sometime to rectify these errors. How did he become the CM of Delhi? He became CM becoz people wanted so. Which people ? CONGRESS PEOPLE? Mani Shankar Aiyar hints or thinks. Intention is not everything! Well-meaning policies often produce the opposite effect: increase corruption and poverty. Eliminating loopholes and red tape helps reduce corruption. But hiring 40 additional "anti-corruption" officers doesn't! Surely, those officers could themselves become corrupt? But, it's been a while since AK took a basic course on engineering economics at the IIT. My fear is he doesn't read: which country pursuing leftist economic policies has prospered? And who is Mr YY? What are his credentials on economics? How come he's your economic advisor? He is not going to let you fix any errors! Saddest thing, though, is the latest double talk on evidence related to Sheila D. And you are fighting corruption? 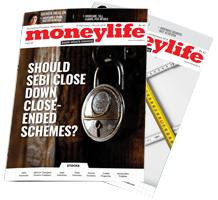 Again moneylife comes up with a nice analysis and shows the facts. AAP is just like BJP/Congress. I believe we need 'Poor' aadmi party now, anyone up for grabs? yes you can leave your job and replace kejriwal.i cannot do thats y asking. But gauze urself before commenting on kejriwal otherwise CONG-BJP wont let u live/breath. The article is about an AAP policy which appears to be economically flawed. Great article, btw, and look forward to the next part. we all know Money Life is PRO BJP, kindly dont stoop so low, if you wish to highlight, please do write to them AAP of the apprehensions you had mentioned, then based on their response, do comment. It will be a trust worthy behaviour. BJP will make Moneylife financial adviser or so? so we will be safe from SEBI /NSE-BSE and UID. How does political inclination matters in bringing facts with data. Did you do your maths before commenting ? If the above data in article is wrong then post it here and then argue. Higher benefits for the better-off? Get 10% off on purchase up to Rs 10K and 15% off on purchase more than 10K. The greater you spend, may or will result in greater saving. Its not designed to enhance consumption. A simple waiver till use of 400 Units. And 400 units in a billing cycle is normal consumption for common man with family. The real problem with most of us is defination of Aam Aadmi. We don't expect them to own a car, AC or a 2BHK or watch movies at multiplex. If someone who finds tough to arrange for 2 meals a day, we call him Aam Aadmi. He has analysed and placed the facts. The Central Bureau of Investigation (CBI) is probing alleged corruption to the tune of crores of rupees in sale of VIP or emergency quota tickets in the Railways. The agency has sought records for the last two years, claiming that even signatures of members of Parliament (MPs) have been forged to confirm the tickets in some cases. On an average day, as many as 35,000 tickets in various classes of all trains that originate from Delhi or cross the city are reserved under the emergency quota which is also known as VIP or Headquarters quota. The agency suspects that certain vested interests within various unions of railways and in alleged conspiracy with private travel operators confirm these tickets against a premium, official sources said. The sources said that the agency had some requests which had forged signatures and in some cases even the letter heads were fake. Initially, the probe may be limited to the national capital but, if required, it may cover other states, they said. CBI has already registered a preliminary enquiry (PE) last week against unknown persons to carry out a thorough probe for misuse of the railway tickets issued under quota to various railway unions. The quota is meant for emergencies which includes medical necessity but the agency has alleged that the process was abused by certain vested interests. It had found some related documents while looking into the functioning of railways as part of its probe into the alleged bribery case involving the nephew of former railway minister Pawan Kumar Bansal. In May last year, the CBI had also searched the office of an RPF inspector who had allegedly helped the sacked Railway Board member, Mahesh Kumar, besides shifting some movable assets from his Mumbai residence. Many documents which pointed to a scam in railway ticketing were recovered from there. CBI had, during a discreet probe, claimed to have found that the emergency quota tickets to unions were being handed over to some travel agents who used to charge a huge price for confirming a wait-listed ticket. A senior CBI official claimed it was a full-fledged racket. The official said the travel agents had been identified and would be called for examination soon besides some of the office bearers of a few railway unions who had allowed confirmation of wait listed tickets. Maharashtra government that was 'forced' to reconsider the judicial panel report on Adarsh Cooperative Housing Society (Adarsh CHS) scam, on Thursday, partially accepted the report and decided to form a committee to decide upon further action. Last month, the Maharashtra government rejected the report of the judicial commission of inquiry on the Adarsh CHS scam that indicted several politicians, including four former chief ministers of Maharashtra, for blatant violations of statutory provisions. The report of the two-member commission headed by retired High Court Judge JA Patil came down heavily on those in authority, describing the scam as a bad precedent. The report of the two-member judicial commission had indicted several politicians including four former chief ministers—Ashok Chavan, late Vilasrao Deshmukh, Sushilkumar Shinde and Shivajirao Nilangekar Patil—for blatant violations of statutory provisions. Several bureaucrats were also indicted in the report. While accepting the judicial commission report in parts, the Prithviraj Chavan-led Congress government accepted quid pro quo allegations against former chief minister Ashok Chavan. On the other hand, it gave a clean chit to former chief ministers, Sushilkumar Shinde and late Vilasrao Deshmukh, and ministers Sunil Tatkare and Rajesh Tope. • Adarsh Cooperative Housing Society (CHS) was floated in 1994 by RC Thakur, an officer with Defence Estates Office, as the chief promoter and Brig Wanchoo (retd) in 1994 as the secretary. • The Society was meant to be for serving and retired defence officers who have not been able to procure a shelter despite full length of service to the motherland. • The 8,300sq mtrs of land lying adjacent to Oyster and Dolphin buildings was chosen for the Adarsh CHS but it fell in the Coastal Regulation Zone (CRZ) and no building is allowed to be constructed 500 metres from the high tide line. Hence, the proposal was rejected by the Collector in 1994 and then in 1998 too. Both Thakur and Wanchoo continued to persist – even wrote a letter to Narayan Rane, the then chief minister – for shelter to members who have dedicated their lives to the service of the motherland. They failed. • One Captain Kala introduces Thakur to Kanhayalal Gidwani, who was a Congress person and had great influence over its leaders. Thakur and Wanchoo requested Gidwani to represent the case to get the required permission for the “welfare of the defence personnel”. • Twelve letters written by Gidwani to various government authorities including chief minister Vilasrao Deshmukh in 2000 made the same appeal–to look into the genuineness of the case and the sacrifice made by military officers to their motherland. • The office bearers of the Society also tried to ask the Ministry of Environment and Forests (MoEF) to change the CRZ to II level from I so that they could get clearance for the building, but failed in their attempts. • Thereafter, the Society members wrote to the then Minister of Revenue, Ashok Chavan and suggested that another alternate land measuring 3,854 sq mtrs should be considered but it is in physical possession of military authorities. They appealed that it should be taken back from the defence authorities. The letter also proposed that the state government had proposed to widen the Cuffe Parade Road and join it to 60 mtrs wide road known as Colaba-Uran Road. Since that did not come through due to ban in reclamation land, this could be adjusted by making changes in the DP plan and added to the land for making Adarsh CHS. • The then Chief Minister Vilasrao Deshmukh showed great enthusiasm and asked for the file and wrote “please call for the proposal and put it up immediately”. That began a trail of permissions to be sought from different authorities. • Besides the Collector who cleared it, Col SS Jog on behalf of the GOC-IN-C wrote that the said land falls out of the defence boundary and therefore, decision may be taken for the housing welfare of the military personnel. Collector Debashis Chakrobarty submitted his report stating that the proposed society is for 40 top grade officers of the army, navy and defence estate personnel. As far as taking the land which was dedicated to road widening, a clearance should be taken from Mumbai Metropolitan Region Development Authority (MMRDA). • On 2 June 2000, a letter was written to the then Revenue Minister Ashok Chavan requesting him to consider 40% civilians as members for the Adarsh CHS, thus making it 19 members from the civilian side and 31 members from the defence. • MMRDA also gave a nod to the reduction of the Captain Prakash Pethe Marg and the state government changed the zoning from road to partial residential. • The greed was not over though. 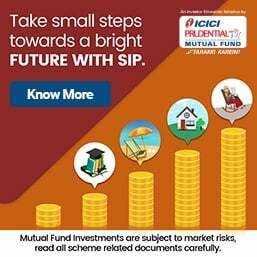 In 2003, Gidwani proposed that the Adarsh Society be given additional floor space index (FSI) from the nearby BEST depot also, besides eating up a part of the Pethe Marg. And the reason? Thakur wrote to the then revenue minister that since the civil members have risen from20 to 71, which has been approved by the state government, additional FSI should be granted to ensure decent housing for these members. This meant swallowing a part of the 2,669 odd sq mtrs additional space from the BEST land which was reserved for bus depot in the DP. Adarsh CHS was permitted to use 700-odd sq mtrs for commercial use and so a part of the Bus Depot reservation was changed to residential use. • The Report remarks: “It was also noticed that some persons, for instance a driver in a remote place at Nagpur who had never been to Mumbai or an ordinary vegetable vendor sitting on the side of the road making a modest earning all of a sudden goes for buying a flat in Adarsh CHS although he has no intention of leaving his place of occupation or residence”. • Adarsh CHS enjoyed political patronage of four former chief ministers, late Vilasrao Deshmukh, Sushilkumar Shinde, Ashok Chavan and Shivajirao Nilengakar Patil as well as two ministers of state Sunil Tatkare and Rajesh Tope. Where we are heading if we have government that approves CORRUPTION and shields GUILTY?What kind of signal we are passing to next generation. ?All in governance are there to loot NATION.This is because we have never ending trail of judiciary.This system is used by mighty to prolong and to remain in power as ever. The politicians and bureaucrats jointly loot the national wealth taking advantage of the positions they occupy. Now the attempt is to trap only Bureaucrats and allow politicians to escape from follow up measures if any. The corruption is designed by Bureaucrats and they take extra pains to ensure that when ever policies are framed on any issue,there is scope for making money and this has been going on for decades unquestioned. Now the media is alert and keeping a watch on the atrocities committed on both intelligent and gullible public alike,people come to know how the society's wealth is looted in the cover of democracy. Money Life has been playing a very active and vigilant role deserving all support and appreciation. It is a shame on democracy. The Congress governments are unable to see the writing on the wall. Once they are kicked in the bourses ere long, it will be no holds barred to put several politicians who are fraudulent and who perpetrated fraud would all be counting the bars in the jails. Just because Rahul/Sonia now disappoved that the CM came out in a 'selective acceptance' leaving out the NCP Ministers of the UDD because their party blackmailed him. The Governor on the Govt. advice has withheld his approval for CBI procecution of Ashok Chavan. Instead of any knock on the knuckles for the guilty babus att their allotments need to be cancelled and the building converted into a Miltary Hospital. India's ruling criminals are adept at protecting their own. They have had sisty six years of practice!